The Research Extension Apprentice Program (REAP) has just come to a close after 2 weeks of learning, fun, relationship-building, and skill development. REAP is a program for high school juniors and seniors that are interested in Agriculture and/or Human Sciences. The program is 2 weeks long and provides on-campus room and board for the students along with conducting many fun and educational activities. The goal of the program is to educate students in research and extension related topics in a fun and interactive way, and motivate them to pursue a career in Agriculture or Human Sciences. From June 15th to June 27th, the students attended a series of workshops and activities that were designed to teach the students skills that can help them be more efficient and maximize their potential and introduce them to some of the basics of Agriculture and Human Sciences. They discussed topics such as, the power of meditation, basic nutrition, the benefits of juicing, the power of forgiveness, and effective time management. The students also attended curriculum oriented seminars conducted by CARC researchers and scientists where they learned the basics of different agriculture and human sciences. They learned about chemistry, different types of soils, natural resources, environmental systems, hydrology, veterinary medicine, growth and development of livestock animals, and more. The students were also able to visit the George Bush Library in College Station where they toured the museum and learned about former President George H. W. Bush. They also took a trip to Peckerwood Gardens in Hempstead where they were able to observe several different types of rare and uncommon plants. The program came to an end on June 27th with a closing program for the students, parents, faculty, and staff in which the students were able to give emotional speeches and reflect about their experience in the program. The closing program also featured speeches from faculty and staff members of CEP and CAHS including a motivational speech from Dean of CAHS, Dr. Alton B. Johnson. Some of the students also took turns as Master of Ceremonies, and some entertained the crowd with dance and spoken word performances. 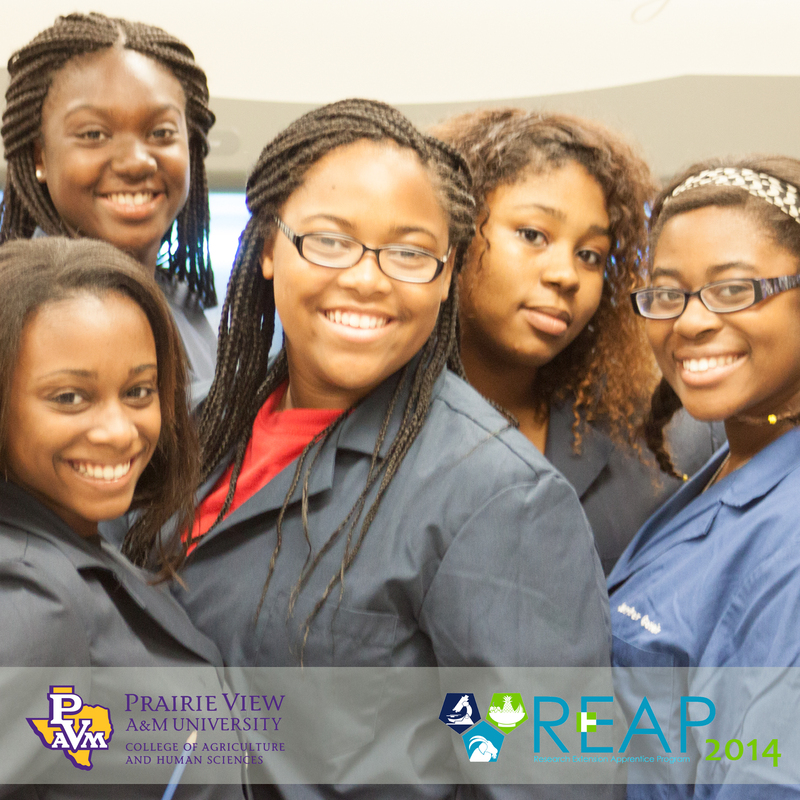 REAP 2014 turned out to be a success, and all the participants enjoyed their experience and their time at PVAMU. They all left with new friends and new skills to help them stay motivated and be successful and attend college, hopefully, at PVAMU CAHS. This entry was posted on Friday, August 1st, 2014 at 4:51 pm and is filed under 4-H & Youth Development, Agriculture and Natural Resources, Animal Systems Research, College of Agriculture and Human Sciences, Community and Economic Development, Cooperative Agriculture Research Center, Cooperative Extension Program, Family and Consumer Sciences, Food Systems Research, General CEP News, International Goat Research Center, Natural Resources and Environmental Systems Research, Plant Systems Research. You can follow any responses to this entry through the RSS 2.0 feed. You can leave a response, or trackback from your own site.